I could be mistaken, but I believe its proper name is “The Constitution of the United States“. I believe that document (first ratified by the People in A.D. 1788) constituted or created an entity called “United States” which is commonly referred to today as the federal government. But there’s also confusion as to whether that “Constitution” created a “federal” government or a “national” government–or both. I don’t know the answer, but I speculate that the “general government” acts in its “federal” capacity whenever it deals with the States of the Union, and in it’s “national” capacity whenever it deals with foreign countries, international law, the territories and/or Washington DC. But that’s pure speculation. Some people believe that Constitution’s proper name is “The Constitution for the United States of America” because the last phrase in the Preamble to the Constitution reads “. . . do ordain and establish this Constitution for the United States of America.” That belief might be correct, but I disagree. I believe that the text in the Preamble is telling us that “this Constitution” is being ordained and established “FOR” the benefit of the pre-existing entity named “The United States of America”. I.e., I strongly suspect that the “United States” was created to serve as a fiduciary for “The United States of America”; and, conversely, “The United States of America” is the principle beneficiary of “The Constitution of the United States”. 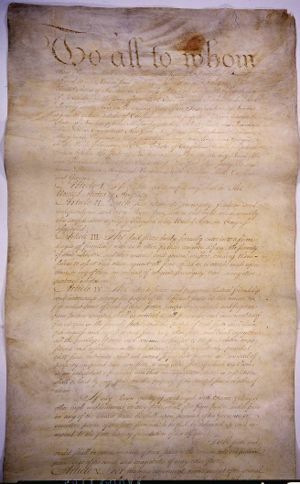 Q: What other document predated “The Constitution of the United States” (ratified by the People in A.D. 1788) that might’ve constituted/created “The United States of America”? I read Article 1 to mean that the Articles of Confederation created or constituted an entity whose proper name is “The United States of America“. If so, then the Articles of Confederation are the “constitution” of “The United States of America”. Again, I therefore believe that the later instrument that came to be called “The Constitution of the United States” created/constituted another entity called “United States” that was separate and distinctly different from “The United States of America”. Again, I believe that the “Constitution” constituted the entity “United States” to act for the benefit of the beneficiary named “The United States of America”. There are certainly a host of differences between the two documents and the entities they each created. However, I see a fundamental and glaring distinction between the two. If you read and compare the “Articles” to the “Constitution,” you’ll see that “The United States of America” includes only the States of the Union. There is no proviso for territories owned by the federal government, nor is there any proviso for a federal “district” that is currently called “Washington DC“. On the other hand, the latter “Constitution” provides for the federal government to have exclusive legislative jurisdiction over territories and allows for the “district” that is now called “Washington DC“. If so, then if you are in Washington DC or one of the “territories,” you are presumably in and under the jurisdiction of the “United States“. If you are within a State of the Union, you are within and under the jurisdiction of The Unites States of America. I speculate that a primary benefit provided for “The United States of America” (the States of the Union) by the “United States” (national (?) government) was to own and operate the territories for the benefit of the States of the Union. This is pure speculation based primarily on my “gut” and could be mistaken. Nevertheless, once this kind of issue is raised, the gov-co will have to overcome any suggestion that there’s a difference between the venue of the “United States” and the venue of “The United States of America”. If the “The State/this state” hypothesis that’s been explored on this blog is true, I doubt that government will want to touch any case that raises the issue of the difference in venues between “United States” and “The United States of America”. Once the issue is raised, one of two things is true: either 1) the “United States” and “The United States of America” signify the same venue; or 2) they signify two different venues. If the gov-co declares that “United States” and “The United States of America” signify the same venue, I’m good to go because then I can’t be in a “territory” (where I have virtually no meaningful rights) but must be within a State of the Union. If the gov-co admits that “United States” (this state/territory) and “The United States of America” (The State(s)) are two different entities, I’m also good to go because I will insist that all of my transactions have taken place within “The United States of America,” and that I never voluntarily left my State of the Union to enter some fictional “territory” of the the “United States”. Even if they could prove that I’m “in this state,” they have no authority over me without my consent. Once I denied that I have ever knowingly consented to be subject to the power (not authority) of “this state,” And I would be much amazed if any prosecutor could find a legitimate jury which would not agree with me. The system appears to depend on the court taking a kind of “silent judicial notice” that the defendant has voluntarily and knowingly entered into “this state”. But once that unstated presumption is challenged by raising the issue of two competing venues, the fictional venue of “this state” must fail. If he knows his stuff, any defendant should be able to explain to a jury that the government should not allowed to prosecute based in the unspoken presumption (that most jurors could not even imagine) that each of us (including the jurors) have somehow “voluntarily” entered into a venue that we’ve never been told about and is fictional, besides. If the two-venue, “The State/this state” hypothesis is true, and if a defendant really understands it, once that issue is raised, the gov-co of “this state” (territory) would seem little choice but to drop the case. Again, this is conjecture. Take it all with salt. But I think it’s probably true. I’ll bet that any address with a Zip Code is in a territory rather than a State of the Union. I can’t prove it, but I strongly suspect that one of the first orders of business is to understand the difference between The United States of America and the United States, and then be prepared to effectively claim that everything you do is within a State (such as The State of Texas or The State of Illinois) which is a member of the perpetual Union called “The United States of America”. Within “The United States of America,” you may have a shot at enforcing your unalienable right to Liberty. In the “United States” you’re a subject or even livestock deemed to be living or transacting in a territory where the Congress has exclusive legislative jurisdiction. Within “The United States of America,” you might be a sovereign. “In this state” of the “United States,” you are, at best, a subject. For more insight into this subject, see “The Organic Law of The United States of America“. THE UNITED STATES OF AMERICA is the same entity as the Constitution of the United States that was passed in 1787. He says: “I don’t have to answer that….”. The “powers” play so many games with the so-called laws that it is almost impossible to properly discern them. The only purpose of government is to rob, steal, and to make slaves out of men, women, and children. The main purpose of the constitution–in my opinion–is to tax the crap out of people and to make life as miserable as possible without provoking civil unrest. I don’t pay too much attention to the political or government stuff because it is like trying to fix something with a broken tool. The document is a freemasonic nightmare; it is stupid, obviously, it isn’t working and you can’t fix stupid. God’s commandments work; man’s laws do not unless they conform to God’s laws. Actually, if I recall correctly, the Hooven & Allison case declared there were THREE different definitions for the term “United States”. Again, if I recall correctly, the Supreme Court declared that they would never again rule on the issue of different meanings for the term “United States”. Plus, while the Supremes admitted that there were three definitions, they never declared that there were ONLY three definition. There could be four. There could be forty. This sounds too fantastic to be true, but when you stop to think about it, WHO assigns definitions? Usually Congress. If you read the U.S. Code, you’ll see scores of pages where the meanings of a multitude of words are defined one way in one Section of the Code, and another way in other Sections of the Code. If you start a thorough investigation of the term “United States” in the U.S. Code, I suspect you’ll find 8 or more definitions. Some definitions include U.S. Virgin Islands. Some don’t. Some describe the U.S. as a territory; some do not. Given that there are several “United States,” which “United States” are you in, right now? Or are you within the singular “The United States of America”? We must also consider what the First Act of Congress did in 1789 for purposes of taking the oath of office. Changes & deletions from the preamble title “the Constitution FOR the united States OF AMERICA” All are to only directed to repeat —————-“the Constitution OF the United States. Words can mean everything and the lack of them can mean more. so who is party to the Constitution as their employment contract? No body. No document exist with the title “the constitution of the United States”. Interesting…I know the jury can rule on the law itself (or statute if you will) but are not instructed to this during the jury process. I fathom if a charming defendent forced all this information to be substantiated in court the jury would become disgusted with the legal interpretation of most all things as they will confront their ignorance with full force. So basically you would turn the tables and try the State for its transgression against the defendent. Where do you find the definition of all 12 jurors as being livestock? I wish that when people say things like that, they would put down where they found such definitions. I’ve written 20 or 30 articles on the subject. You can find them under the category “man or other animals”. The categories are listed on the right side of this blog. Al, loved your theory on the “United States” vs the “united states of America”. The word “united” is an adjective and should not be capitalized, unless (of course) it is a corporate name, It is kind of like the word/name “God”. When used in lower case letters (god) it is merely a title of description. However, when the letter g is caped (God) it becomes a noun, i.e. name. The two consonants, G and D, are in Hebrew the same as the name of the Babilonian deity Gad, pronounced as gawd, which is the same pronounciation as God (gawd). When people use the word God without a word like “the” or “our” or “my”, etc., then they are using it as a name, and that name is Gad, i.e. Bail Gad. The word Bail in Hebrew means “lord” (see Strong’s Concordance of the Bible dictionary for the word Bail). The english phrase “Lord God” is translated into the Hebrew language as the meaning “Bail Gad”! My god is Yahuweh Elohym. The “United States” vs the “united states” is the same old word game; which is pure trickery. Keep up the good work Al, you are starting to open a few eys. Actually the corporation is always all in capital letters. The UNITED STATES is the corporation. It replaces the Virgina company which was formed in the 1600s to colonize America and in that coorporation King James I of Britain and his bloodlines were entitled to 50% of all the silver and gold mined here; 50% of natural resources and 5% of all profits from business ventures. I think it was “Acts of﻿ the Forty-First Congress,” Section 34, Session III, chapters 61 and 62. and when Congress passed “An Act To Provide A Government for the District of Columbia.” This is also known as the “Act of 1871 the corporation was established but the original Constitution was altered. I’m wondering if more than changing the “for” the people to “of” the people and writing everything in capitals were the only changes. Some say we can’t even use the Constitution to protect us because it somehow doesn’t apply to us. I guess they are referring to the newer version? I’m confused. This is a compelling video I found that makes one question everything! Nice insight so lets take it further; There are four Organic Laws, Declaration of Independence, Articles of Confederacy, Northwest Ordinance and United States Constitution and they must be read and understood as a whole from first to last with attention paid to every detail of language of use and dates. For now lets take on the Northwest Ordinance of which the delegates in their secret meeting took on and George Washington only took the Oral Oath as an employee of Congress not the subscribed Oath as executive of “this Constitution” as discribed in the Articles of Confederacy, what happened here is that he needed another two years to become the President of the United States of America and did not qualify for the executive branch and of course if he did he would have to apoint a President for the United States (pay attention to the dates), since he did not qualify he and the others put forth and illusion that he did, and instead set up a business plan for himself and the others and others to come (Roman Republic form) but only within territory owned by the United States of America (Northwest Ordinance) until the states formed a Constitution within said territory and ratified the Articles of Confederacy of which they did and established their respective boarders in their Original Constitutions which all have established borders but No President that was elected to be President of the United States of America has ever Adopted “this Constitution” but the states did so ratify and are still awaiting Adoption, which means the states of the first Union own the United States as ratified and the Organic Law is the Law and it is on the books as such. To think there are courts is a shame, they are all non judicial as agency courts, so the trick is to make you beleive you are a U.S. citizen and get you to vote which again is a shame illusion for by virtue of the Decalration of Independence you are free of all man made governments and by ratification of the Articles of Confederacy you are not a ciizen of anything you are a “free inhabitant” with all the privileges and immunities of Citizens of the state under its Original state Constitutions at Article IV of the Articles of Confederation. There are two forms of law, written and un written, one is the later while the former only applies to employees and the legislative offices of the state, when you hear or read the word state it is Federal United States and it deals with one subject only and that is its employees in the so called Federal Zone which is legislative only, the office of President of the United States is legislative, congress is legislative the supreme court is legislative all courts are legislative all political subdivision are corporate chartered subject to the Fed, all police are employees without and oath its oral and non of these positions have any responsability for they fall under the 14 th amendment of the United States, further if you are a voter you are in rebellion. Now, this was just for openers, I suggest you read the Organic laws to clarify all, its up to you to secure your unalianable rights. For more insight on the subject go to your search engine type in Ed Rivera and read, great edification there. My screen goes down so far and I can’t get it to move up. Anyway, to Michael Reagan, the Catholic Church, Congressman West – now Colonel, The Liberty Channel – John Bonett, Glenn Beck, Billy Graham, the Becklet Foundation, etc. They don’t call me back – when I do reach them, I get told dumb things like it will be up to the Governors, etc. No, it, ultimately will be up the The People. There will probably be a blood bath when they get to the gun issue. Guns are selling like hotcakes. This could be a 2nd American Revolution. I’ve heard some say, we will defeat him in the next election. No, I don’t believe it because I think we will be under UN control by then or tyranny. Well, we already are to come extent. Facebook is no longer Free Speech. There was so much corruption in the last election – and he got by with it – I don’t see how that can get any better. Taxes will be going up to an unGodly figure – not just for the rich as he planted a few little goodies for myself in the Obama Healthcare Bill. Since nobody ready it, they didn’t know. He wanted to make sure he had money. He don’t have an idealogue, we do have evil. You know, I even got into a ham radio site, where I heard US news in China – they knew more than I did. You know, our soldiers risk their lives everyday in the name of Freedom – why? Get those guys home. But, if our Representatives aren’t willing to take a bullet, then they should not be representing us. It is completely backwards. We need the soldiers in Washington and cowards in Iraq and Afghanistan. I am sorry, I have told almost all of them that they are wussies – particularly the Republicans. Why are they so concerned about getting re-elected when they should be concerned about this Country. How much money are they actually making as a Congressman or Congresswoman – is it so much that they are willing to sell out this Country? I could not do that. NO BALLS on Capital Hill except for Obama and he needs an exorcism. BUT, the consitution is a formal, legal document, which people are supposed to be able to look to formally to understand legal issues that could, potentially, send them to the gallows or aquit them. Usually (and formally), even if you are going to abbreviate a name, the formal name is introduced initially, especially in a formal writing, and then the shortened name is used. NOTICE, that in the preamble the abbreviated “United States” is used first, and the formal, “United States of America” is used last. And in the same sentence! NOTICE, also, that in the very first statutes at large passed, the title is “LAWS OF THE UNITED STATES,” which were passed by the House of Representatives and the Senate of the United States of America in Congress assembled. WHAT???! Grammatically speaking, formally, shouldn’t the title be “LAWS OF THE UNITED STATES OF AMERICA” and then use the abbreviated form (if it happened to be the same entity) subsequently? I think so. The United States is a privately owned corporation formed in 1871 in Delaware as a Roman trust. It was formed from a few previous corporations on was called The Virginia Company. All corporations have to have a president, vice president and a secretary treasurer. Obama is the President of The United States Corporation. I didn’t mention that it is a foreign owned corp. This is why Washington D.C. is not part of the united states of America. It is it’s own country with it’s own government and laws. Research a capitonym and you will find that it is a word that has it’s meaning changed because of the first letter being capitalized. The United States does not serve the American people and it never has. If you are a u.s. citizen by law you are an employee of The United States Corp. In 1933 Rossevelt transfered all the citizens birth certificates to the department of commerece and pledged all the citizens as collateral for The United States Corp. debt. The first United States citizens were the freed black slaves after The Civil War. If you are a U.S. citizen you and your children are considered property by law of this privately owned foreign corporation. I have found the definitions of “antonym,” “synonym,” “acronym,” “homonym,” but not “capitonym.” Please identify where we may find the definition of this word. By the way, “constitution” means something which constitutes something else, such as character, property, etc. So, the “constitution” of the united States also means the land [belonging to all of us] and other property as well as the people who take care of the property (those in government), which makes up this organization we call the United States, or UNITED STATES, as the case may be. [I call it “the ranch.” Along the lines of: the constitution of (that which constitutes) my ranch is the land, the fences, the barns, the house(s), the livestock, the creeks, ponds and fish, turtles, snakes, etc. and the ranch-hands.] The “ideals” don’t really need to be protected from foreign invasion, other than lawyers. The “property” does need to be protected from invaders. It’s evidence that “United States” and “The United States of America” are two different political entities and/or jurisdictions. Since the United States of America had no sovereignty or other form of possessory rights over the Philippines in 1946 to “give away” (it was ceded to the United States by Spain) one could conclude that until the United States ” agrees to withdraw and surrender, and does hereby withdraw and surrender, all rights of possession, supervision, jurisdiction, control or sovereignty existing and exercised by the United States in and over the territory and the people of the Philippine Islands” it will retain sovereignty over the Philippines and does so at this time. (4) “Property” means real and personal property. by a person with present intention to authenticate a writing. legislative authority of the United States of America. other agency of the United States of America. (10) “Week” means seven consecutive days. (12) “Year” means 12 consecutive months. by Acts 1989, 71st Leg., ch. 340, § 1, eff. Aug. 28, 1989. By the way, “include and including” used to be words of limitation until the control mongers (lawyers and politicians) figured out that we were on to their schemes. Now, “include and including” are terms of enlargement. That makes more problems: if “include and including” are terms of enlargement and now doesn’t limit the meaning(s) of other terms and phrases, can any statute that uses “include or including” in the definitions be constitutional because now the definitions can mean more than what is being defined, making the definitions unsure and unconstitutionally vague? That is not to mention that prior to the “enactment” of the statutes defining “include and including” to being terms of enlargement, “include and including” were terms of limitation unless the phrase, “including but not limited to…” was used. I would have to ask the gubment, “when was that law passed? since “include” meant “means” at the time the statute was originally passed, and cannot mean anything else (just because you now redefined a word that has been used for 100s of years) up to the time the new meaning of “include and including” took effect. “I am talking about the material substance….” “No, I am talking about the philosophy……” Either way, I can deny one or the other. Did it ever occur to you all that words”, of and by themselves, have no force whatever. For example, take “right”: It is obviously a “defended claim”. A right doesn’t exist without a claim. And it is empty without a defense. You can claim a “right to life”, but if you can’t defend it, there is no right. You can claim an “inalienable right” and if you can’t defend it, it “will” be alienated. You can claim a “god given right” but it’s pretty empty among non-believers. The same is true of laws. That higher you are on the food chain the more irrelevant and malleable laws become. If you really want to explore this subject consider it from the other direction. What does it take to disunite? … to “dis-constitute”? Answer: As we learned in our “so-called” Civil War, it takes force … and you better have enough of it. A glaring flaw in the constitution … no buy/sell agreement. Would “you” enter into any partnership without one? What we need right now is Civil Iterative Secession. States should secede from the “union”. Then counties should secede from the “state”. Then townships should secede from the counties. At the limit, government should only exist to the extent people need it … not the extent that the elite need it. It should exist only when “all” other alternatives have been exhausted. Everything the authors of the “anti-federalist” papers wrote has proven to come to pass. Read Maclay’s Journal … it started to unwind on day one. The foundation should be enumerated principles … not laws. There is no law when you can create 40,000 new ones each and every year … and then ignore them at will if you have enough stroke. Any “supreme court” decision should be nine to none … or deemed undecidable. As for democracy: It doesn’t work at all when more than 50 people are involved. Don’t expect it to. Adopt a system where no more than 50 people make decisions. If you take six levels of groups of 50 people, each contributing one person to the next lower group, you can “represent” all the people on Earth many times over. Why did WTC7 fall down? Why do less than 6% of the population even know about it? We are an occupied country with an occupied government. Therefore, “everyone” working for the government (including all military) is a traitor. And everyone financially supporting our occupied government (i.e. tax payers and fee payers) are traitors. By personal experience … not being a traitor is a lonely and dangerous business. It’s true that “resistance to tyranny” is no game. It’s hard, long-term and difficult work. In the end, it’s spiritual warfare which I believe we are obligated to wage in this life–even though our chances of success are negligible until the Messiah’s return. I basically agree with what you’ve written with one exception/quibble: You said that a right cannot exist without a claim. I would say that a claim cannot exist without a right. I subscribe to the principle that “all rights flow from title”. If you want to exercise a “right,” I suspect that you must first identify your personal title to that right. Then, based on your title to the right, you can make a claim. I can’t prove it, but I strongly suspect that the mysterious 12(b)6 objections (“Failure to state a claim for which relief can be granted.”) may be based on the claimant’s failure to specify his “title” to whatever right is being claimed. From my perspective, you can’t just make a claim. You can’t just claim a right. You must first specify your “title” to the right and then, based on that title to right, you can exercise that right to make your claim. Originally, it was “The United States of America”. Read the Article of Confederation (A.D. 1781). That document expressly declares in quotes that the proper name of the newly-created confederacy and perpetual Union would be “The United States of America“. I didn’t read the wwhole article because it seemed the author unaware that there are 2 constitutions. The first is the constitution for the United States of America. The second is the constitution of the UNITED STATES. The UNITED STATES IS NOT THE United States of America but rather a corporation or person. Just as you are you the natural living human who was created to be free SO IS the United States of America. But when you were born they turned you into a legal person and took the name of the free human you were given at birth and made this person YOUR NAME….all capital letters…this denotes the legal fiction you were trained to answer to. It is found on your social security card, your drivers license your bank accounts and credit cards. You were made into a legal entity without your consent and thus you and i are no longer free Americans but rather akin to the emancipated slaves. We were all subjugated and turned into commoditiez by the14th amendment…but i digress. Good thing you didn’t finish reading the article or any of the other articles I’ve written on the US vs The USA distinction. If you had you might have deduced that after about 20 years or writing on those subjects, I may not seem to know some of those subjects because I no longer dwell on them. I assume that most people reading this blog come here with some understanding not only of what I write, but what I’ve written in the past. That’s a bad assumption on my part. Still, after writing on this subjects for most of 20 years, I can’t write every article as if it’s addressed to Kindergartners. That means I assume (again, dangerous) that most of my readers have enough grasp of some of these ideas where it’s not necessary for me to start each article with “See Spot run! Run, Spot! Run!”. In the end … in the final analysis … the whole notion of government and governmental authority and government territory … they are all totally bogus. It just becomes: I am stronger than you so my lie prevails … and “you” must turn over 3/4ths of what you earn to us, the mish mash of governments who claim to serve you and have authority over you. Larken Rose get’s it right when he asks: How can a person with no power over another, give to a group of people such a power? How can you transfer a power you don’t have? Short answer: You can’t. Longer answer: Tough … we claim authority over you anyway and you can do nothing about it. Think otherwise? Just try! and their differences – about 30 years ago by an attorney – but can’t find it anymore. You might be talking about the Hooven and Allison vs Evatt case from the 1940s (if I recall correctly).